"Maxine Elliott as Lydia Languish in "The Rivals" "
Maxine Elliott as Lydia Languish in "The Rivals"
A photograph in the Diana Forbes-Robertson collection on her aunt, Maxine Elliott, an internationally renowned actress born in Rockland, Maine in 1868. The photo mat includes the stamp, "The Falk Studios, 496 George Street, Sydney." 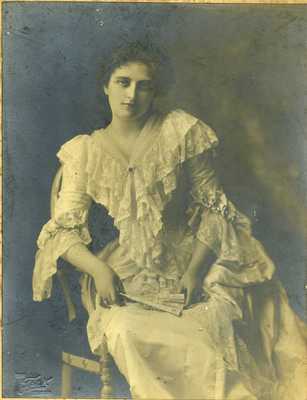 Written in handwriting on the back is the phrase, "Maxine Elliott as Lydia Languish in the The Rivals."